on a shopping spree in Jodhpur. 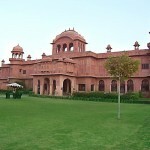 Being a famous princely city of Rajasthan, Jodhpur has a variety of colorful handicrafts to offer. And no wonder shopping at such a destination is such a pleasurable and satisfying experience. 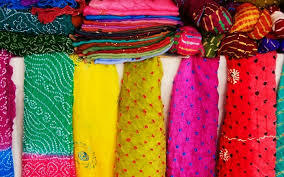 For shopping the city offers several bazaars, pavement stalls and handloom houses. Explore them and pick up some wonderful handicrafts. The city is well known for its antiques, bandhini, footwear and red chillies. Once one of my friends told me that whenever I visit Jodhpur, I must get Jodhpuri Suit. I scanned a few shops and could finally select a beautiful Jodhpuri Suit for myself. It is a purple colored suit designed with zardosi and cutdana beeds. I wanted to buy some saris for my mother and friend. My guide Shankar suggested me to go to the Sojati Gate as it is famous for wonderful tie and dye saris. The shopkeeper showed me bandhini saris in cotton, chiffon and silk clic. The saris were available in many vibrant colors and it was really difficult for me to choose as I liked all. Finally I could choose four beautiful saris. Next I made my way to the Station Road, which is famous for leather articles, embroidered footwear and utensils. I bought embroidered jutti for myself and a leather bag for my mom. I also bought two beautiful paintings and a carpet. Now was the time to pamper my stomach with typical Rajasthani food. I sat at one of the good restaurants to dig into the famous dishes of Jodhpur. I ordered the famous mawa kachori of Jodhpur along with a big glass of lassi. It was simply delicious. The next item on my shopping list was spices. Knowing that the Clock Tower is the best place to buy spices in Jodhpur, I headed for it. I bought a variety of spices and decided to go back to the hotel as I realized that if I stay at the market for some more time, I will surely end up with no money. Well I think its not my fault as the enchanting Jodhpur has so much to offer. «Next Post Jodhpur Kite Festival- Paint The Sky With Colorful Kites!